"No giant mechanical death machines here!" Ready to play some ball? Grab a team, suit up, and climb inside your human! Prep its thrusters, lower its all-terrain wheels, and spin up that flailing magnet-arm. It’s time for Regular Human Basketball! It’s the multiplayer party-starter that has your team wrestling to control your giant mechanical death machine. 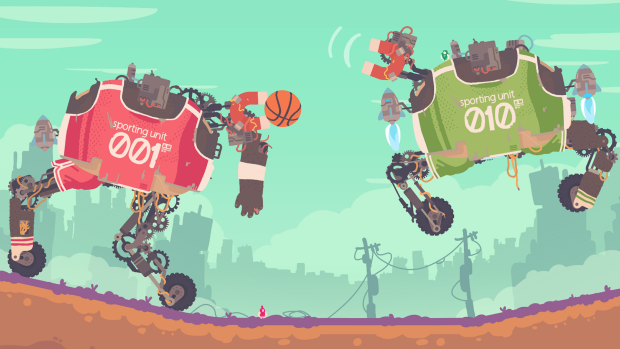 Yelling orders, flipping switches, and shootin’ hoops in a post-apocalyptic basketball showdown. Online + Splitscreen Multiplayer for 2 or more humans. You and your teammates share control of the various parts of your human- including thrusters, magnet arm and all-terrain wheels. Of course the original version, made in a few weeks back in 2015, is still Free to Download! Special thanks for the original goes to Ben Weatherall (@sunraheadgear) for the soundtrack and background art, and Louis Meyer (@louisdmeyer) who put together the hilarious commentary system. It’s so close I can taste it on my organic human lips. Tastes a bit like raw spaghetti, or the taste we all feel when opening a window on a hot summer night. Puts me in the mood for wishlisting! Stay up to date on Powerhoof and be notified when we have cool stuff to show!